Many communications service provider (CSP) have already begun their digital transformations, with customer experience as a primary driver. TM Forum recently surveyed 100 CSPs about transformation, and nearly three quarters said that developing stronger customer relationships was a top goal for their programs (see infographic). This means deriving value from the tremendous volume of data available to them, which requires rapid, intelligent analysis and intelligent distribution to critical business and operations processes and systems. Understanding customer experience requires analyzing data accumulated about a customer’s interactions with a CSP and real-time data relevant to what they are experiencing as the journey unfolds. Comprehensive episodic analysis ensures that complex event data is quickly and efficiently used to improve the customer experience. Over time, machine learning enables operators to further understand customers’ behaviors and proclivities such that the right offer can be made at the right time and potential problems or bottlenecks are recognized and resolved before customers are impacted. Understanding the business impact of customer experience in real time helps CSPs prioritize deployment of new service offerings, customer support upgrades and even network expansion. Tracking the impact of customer issues will contribute to more effective business, product and operational planning, and help prioritize spending. 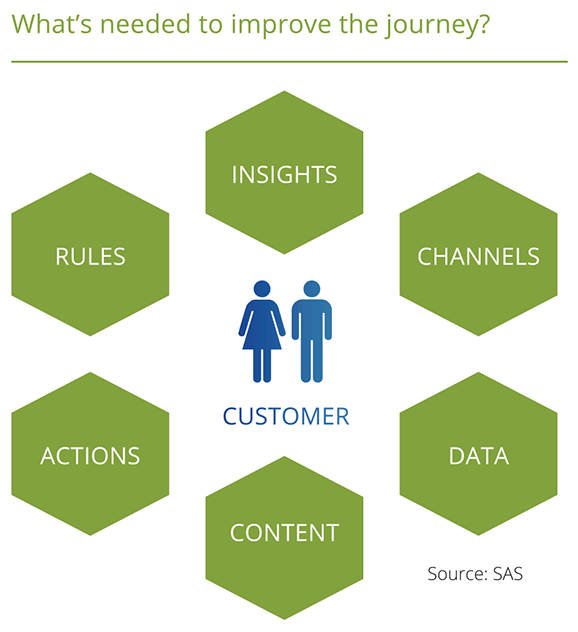 The infographic over the page shows six important factors to consider for customer journeys. Creating models of a customer journey is an iterative process that involves marketing, sales, product managers, support staff and others. The good news is that we’re all customers, and if we were asked to map our journeys, we probably could, at least at a high level. Capturing that thinking and making it part of managing customer experience initiatives helps move the strategy forward and better engages customers of all types. Telefónica Global has embarked on a massive digital transformation effort which includes changing the way it interacts with customers to provide a truly digital experience. An important focus is increasing average revenue per user (ARPU) and reducing churn. The traditional approach of after-the-fact batch processing of transactions and events was insufficient to understand what a customer is doing in real time, so Telefónica implemented a real-time decisioning solution that analyzes streaming usage data. This allows the company to make offers to customers more rapidly. Telefónica is currently processing 20,000 transactions per second from usage, network, support and external data streams. As a result, the company has been able to reduce the time to build a campaign from three months to a few days. By quickly providing marketing personnel with visibility into key metrics across touchpoints and data sources, Telefónica can react quickly regardless of channel, using automated actions based on a comprehensive view of the customer. Telefónica’s impressive results appear to be the rule rather than the exception and are consistent with the findings of a Forbes Insights survey of enterprises that found 91 percent of enterprises that are fully engaged in the use of data and analytics are seeing revenue increases. But in the TM Forum survey as well as another Forbes Insights survey (Data Elevates the Customer Experience: New Ways of Discovering and Applying Customer Insights), the potential of data and analytics remains underutilized. In the TM Forum survey, more than 60 percent of service providers are trying to analyze and map the customer journey, yet fewer than 20 percent maintain accurate customer profiles, fewer than 10 percent deliver personalized content or tools that enable marketing control of content, and fewer than 10 percent are implementing analytics and machine learning to help. Needing to be a customer-centric business is not idle talk, it’s imperative to future success. A ubiquitous network means that CSPs are judged based on customers’ perceptions of: time-to-deliver new products both to the market and individuals a variety of services and single-identity support from multiple sources via any channel quality of delivery, operation and support of purchased services price and the flexibility to pick and choose desired services and features. Creating and maintaining a top-notch customer experience requires analytics, machine learning and the automation of intelligent processes that take full advantage of the data collected from and about customers, channels, services, support, network quality and operations. The amount of data available about customers’ journeys continues to exceed the ability of staff and systems to analyze it. Adding an analytics processing layer and methodology is proving to be a reliable method for integrating internal and external data, structured and unstructured data, with real-time and archived data. However, analytics is not a tool, but a technology. CSPs need to inject analytics into customer journeys and dynamically adjust processes and systems based on the outcomes. Here are some steps operators can take now to analyze customer journeys and deliver a better customer experience. Overlay analytics – to decode the customer experience, analytics must become part of daily operations. Adding an analytics processing layer enables CSPs to take advantage of data sources and influence processes faster and with less risk. Think outside the conference room – trying to support customer journeys from the confines of a conference room won’t work. Get close to employees who are closest to the customer –they know exactly what problems customers are experiencing because they hear about them every day. Spend time in those environments and learn firsthand what your customers are experiencing. Work from the outside in – seeing your business as a customer sees it is critical when mapping a customer journey. Basic models exist for retail and support journeys, but there are both subtle and substantial differences between those journeys and that of a DSP customer. We’re all customers and most employees would be happy to contribute to the mapping of a customer journey. Create a customer experience roadmap – while nearly all operators surveyed by TM Forum said that having a strategy-led, customer experience roadmap is important, many don’t have a customer experience strategy. For most operators, digital transformation is in its infancy. If experience is a driving force for change, then a customer experience strategy and roadmap are paramount. As a customer support director at a midsized European CSP concluded during our research, “Discovering real customer insight is our biggest challenge”. It is, but by making data analytics do the work, we have the means to gain it. This article is based on TM Forum’s Quick Insights research report Journey to the core of customer centricity, which is free for anyone to download. It was written by Nancee Ruzicka and published in June 2017.